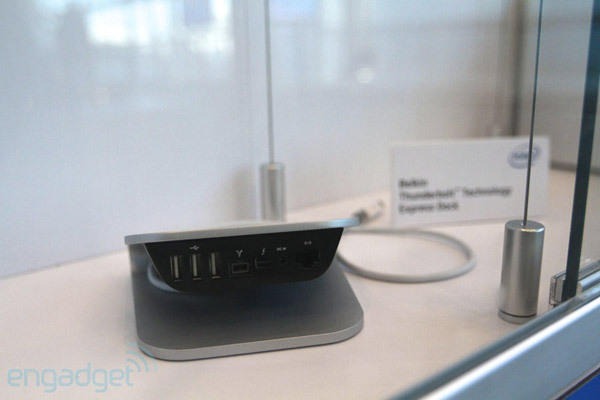 Belkin on Monday introduced its new Thunderbolt Express Dock, which will allow users to connect multiple devices to their Mac with one Thunderbolt cable when it arrives in September for $299. Though it won't be available until later this year, the Belkin Thunderbolt Express Dock will be on display at the company's booth at this week's Consumer Electronics Show in Las Vegas, Nev. The dock will enable Thunderbolt-equipped Macs to access multiple desktop peripherals with just one cable. "People purchase MacBook Airs and Ultrabooks for ultimate portability, but constantly plugging-in and unplugging numerous cable-connected peripherals is an annoying and time consuming ordeal," said Martin Avilla, general manager of Belkin's Core Business Unit. "The Thunderbolt Express Dock provides a much-needed solution that creates a cleaner, faster, more productive workspace and reliable connectivity to desktop devices and the Internet." Includes three USB 2.0 ports, one Firewire 800 port, one HDMI port, one 3.5mm Audio port, one gigabit Ethernet port and two Thunderbolt ports (one upstream and one downstream) for daisy-chaining to another Thunderbolt compatible device. For now, Mac users looking to use Thunderbolt for a simplified docking solution can use Apple's Thunderbolt Display, which allows users to plug in one 10Gbps Thunderbolt cable that can drive multiple devices with its high bandwidth capacity. The Thunderbolt display serves as a docking station in addition to a monitor, and packs three USB 2.0 ports, one FireWire 800 port, one Gigabit Ethernet port and a Thunderbolt port for daisy chaining up to five additional Thunderbolt devices. Again, this is a terrible design, one that makes the thing darn near unusable, and the price is extortion, period. I have to agree, it looks like an apple display stand, and the price ugh!! USB 3.0 would have been nice as would a PCI or esata port, now that would have been useful. USB 2..... Dare I ask if they are powered or not? I was hoping next generation firewire might appear by then, but even USB 3 will be lagging. Do they make "external PCI" or were you seriously suggesting a standard size 16x PCIe slot? Why does this take so long to release? Are they growing the aluminum from seed? Is there any body listening in China that can start knocking out Thunderbolt hubs at a reasonable price ? Does the current TB driver already support all those other protocols (HDMI FW, USB, Ethernet, audio I/O etc.) ? And what is that extra thing on the top? The price probably reflects all the chip and port licensing. Since it's essentially PCI, it can support just about anything using bridges. I'm not seeing the reported HDMI port on this thing, though. It looks like a MagSafe connector for charging MacBooks. The product shot on this device is pretty substandard. Who laid out the cables? Uh, yeah, that totally looks like the same device that's being reported on blogs everywhere. Okay, I might be wrong about this. I sort of hope that I am, because if I'm not, that's about as low as you can go. That cable is the cable on an Apple Thunderbolt Display, hence the MagSafe break-off. These idiots decided to string it (poorly) through their… monstrosity… instead of actually shelling out for a real, proper Thunderbolt cable. I honestly didn't think that they could top that mockup for hideousness, but they have. Who wants a gigantic box on their desk just for PORTS?! Belkin is off in La La Land with this. It's not worth half that price. Yea, do a google search and look at a few other blogs. I see several others with this design and so far, it's the only one that shows an HDMI port. In french, but shows other angles and is a recent image. Either they're making two docks or that's not it at all. This is it. Real image. CES. The individual parts look like they're made by Apple, but the whole doesn't. I mean, when you look at an Apple product you immediately know what it is, but when I look at this, a feeling of wondering what is it comes. Where's the HDMI port they are reporting? Where's the audio? Something along the line of an express 34 PCI card slot was what I was thinking of as the penultimate dongle. But then if the first accessory offered enough expansion then where would be the onus to create more? Where's the HDMI port they are reporting? It isn't on that model, apparently. Wake me up when some manufacturer turns on a few brain-cells and produces one with USB 3. This looks DOA.